Neuroplasticity is one of the hottest areas of science right now. Neuroplasticity is the discovery that the brain can change for the better, at any age, far more than we ever realized. Our brain can help us recover from pain, injuries, and disabilities. Our brain can help us learn more than we ever thought possible. Our brain can help keep us vital longer than we ever imagined. Our brain is a treasure trove of untapped possibilities! The question remains: How do you tap into this remarkable potential of the brain? Click here to learn more about Brain Plasticity and NeuroMovement®. What Is NeuroMovement® and How Does It Change the Brain? The questions become: What needs to move? How does it need to move? And what is the potential of that movement? In the human organism, there are no one-way streets. The mind affects the body. The body affects the mind. In fact, the dichotomy between them is an illusion. It’s a circle. A circuit. 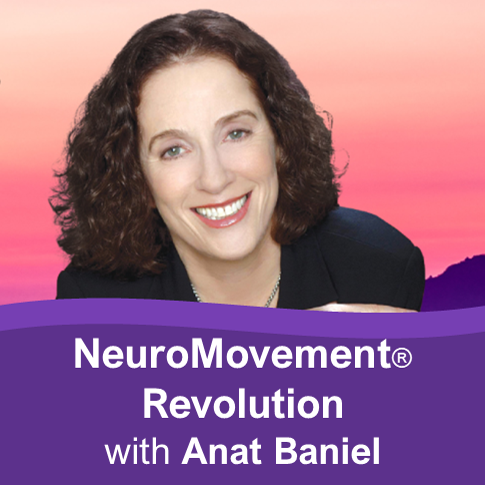 Anat Baniel has spent her entire career, over 30 years, exploring the conditions and the kind of movements that develop the brain. She has defined easy-to-use tools and movements for positive brain change. Anat calls these specialized movements and tools NeuroMovement® and the 9 Essentials. Find out what is possible with NeuroMovement®. Imagine that your brain is like a vault, full of rich possibilities. NeuroMovement® and the 9 Essentials offer the keys to open this vault and access incredible new learning and growth. Each Essential helps your brain create new connections to overcome pain and limitation, and reach new levels of physical, emotional, and cognitive performance. The Exciting News: We don’t know what’s possible. We’re on the frontier of learning what’s possible. This holistic NeuroMovement® Method is proving that the “impossible” IS often possible. We have worked with children and adults who have moved way beyond expectations and limitations. And they continue to learn and develop throughout their lives. Children are amazing learning machines. They depend 100% on learning for everything they’ll ever be able to do. And learning occurs in the brain. With NeuroMovement®, we provide the conditions that make it possible for your child’s brain to become a brilliant learning brain—even for children with severe disabilities. Do you want to overcome pain and achieve greater mobility, vitality, brilliance, and joy in your life? The key lies in your brain’s ability to wake up and create new connections. With the right conditions, your brain can create new solutions for most any challenge, at ANY age. Discover how to tap into the power of your brain with NeuroMovement®. Be at the forefront of the Brain Plasticity Revolution! Become a certified NeuroMovement® Practitioner. Anat Baniel has helped thousands of children and adults achieve transformational outcomes beyond what they imagined possible. She has also trained hundreds of practitioners in this Method to get these same remarkable results with many more thousands of people. In addition to using the 9 Essentials in your daily life, you can choose from a variety of NeuroMovement® video programs. These programs will enrich your experience and help you to access more of your brain’s potential. Find pain relief, gain greater fitness, mobility, mental clarity, and vitality. 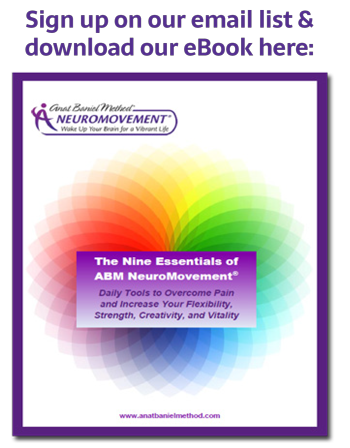 Get our free 9 Essentials eBook and receive 20% OFF select NeuroMovement® Video Programs!